This is a camping retreat, with everyone sharing the cooking and the responsibility for activities for the children. This retreat will provide time for shared activities with the children, like bushwalks, but also time for parents who want to, to be able to meditate while their children are having fun doing other activities. Betsy Faen will provide some meditation instruction for those that would like it, plus the possibility of individual interviews and groups. There is one shared room available for sleeping in, plus wide verandahs for those who don't want to sleep in tents. 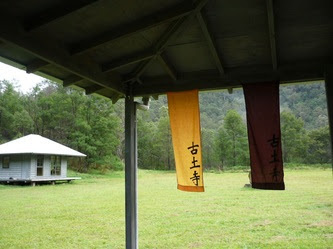 Gorrick's Run has bush toilets and showers, a beautiful meditation hall, and a cottage with a kitchen and dining room. It is in a beautiful bush setting near St. Alban's. Please contact Betsy: 9913 2979, 0403 871 605, or betsyfaen@gmail.com if you are interested.